If you are you looking for a free, creative and imaginative online computer game for your children to play then you may want to visit the ‘All Abilities ePlayground’. Developed by Sonokids Australia, this game is an initiative of the Gold Coast City Council and supported by the Queensland Department of Communities (Disability Services). 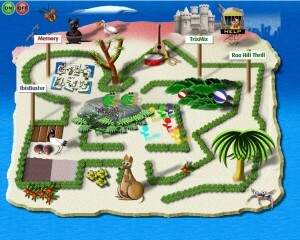 The ePlayground features entertaining actions and four games – IbisBuster, Memory, TrixMix and Roo Hill Thrill. The ePlayground can be played by children using one or two hands via use of a mouse, keyboard, touchscreen, trackball or joystick. If a child is unable to use both hands, he or she can equally participate in the ePlayground by way of switch access (which can be controlled using their foot, elbow or head) or Puff2Play (allowing a child to blow air into a normal computer microphone which imitates the use of mouse click). The ePlayground is also self-voicing, as children are accompanied by their online game mate ‘BuddyFly’ who talks them through game instructions and provides tips along the way. IbisBuster is an adventure game that also comes with a great story, whereby children collect different ‘good things’ and ‘shoo’ Iris the ibis who tries to steal them. Memory is a puzzle-type game with sounds and images where children are encouraged to find the matching pairs. Trix Mix is a creative game with music and animations, allowing children to record musical sounds to a set beat and then re-play their own musical remix. Roo Hill Thrill is an action game in a fantasy setting, where the gamer plays the role of a kangaroo and must surf over green hills and stay clear of beachballs. The ePlayground offers an all-inclusive and safe play environment that stimulates imagination, skill development, independent play and cognitive learning. It also allows for children, their siblings and friends to play and interact together. The ePlayground was developed with the needs of all children in mind, and pleasingly the standard or adapted versions of the game can be enjoyed by children with varied abilities. For all of these reasons ePlayground was a very worthy 2012 winner of the ‘Internet for Good Gold Standard Award’ (Asia Pacific). While the ePlayground is an online game, it is actually the 17th official playground of the ‘Queensland All Abilities Playground Project’. The other 16 playgrounds are ‘real’ outdoor playparks located across Queensland; with the ePlayground an online representation of the inclusive play that children can experience in such playparks.